Anne Cotterill was born in the Borders of Scotland, educated in Edinburgh and graduated from Edinburgh College of Art in 1956 at the time when Sir William Gillies was head of painting. She was awarded a postgraduate scholarship to continue her work in Edinburgh followed by a travelling scholarship to Europe that enabled her to study the work and technique of the great traditional painters. In the 1960s Anne Cotterill moved to the West Country where she and her husband settled and raised a family. She drew her inspiration from the seasonal wild flowers growing in and around her garden and in the surrounding countryside of her West Somerset home. Anne considered herself to be a painter first and foremost, but one who painted mostly flowers. Her studies have a fresh vitality and strong sense of colour imbuing each one with a gem-like quality. The flowers are arranged informally in one of a large collection of vases, pots, jugs and simple jam jars and she painted with the natural light falling from one direction to give tonal values so important in any painting. Her detailed understanding of botany was combined with a focus on light and texture that gives her work great presence and feeling of movement. She worked entirely in oils and painted mainly on board, with background colours kept deliberately plain to accentuate the flower colour. She was a diligent and prolific painter, working for many hours each day to capture the fleeting beauty of the flowers before her. Anne was a modest and retiring person, entirely uninterested in self promotion and never part of any particular movement or group. Her work was always sought after, intitially in her locality and then to a much wider public through word of mouth and personal recommendations. She had many successful exhibitions of her work, including solo exhibitions at Thompson's Galleries, (London and Aldeburgh), the Wykeham Gallery (Stockbridge, Hampshire), the Napier Gallery (Jersey), the City Gallery (London) and the Bellflower Gallery (Devon). Exhibitions of Anne Cotterill's paintings always attracted queues of enthusiastic collectors and demand for her originals far outstripped supply. 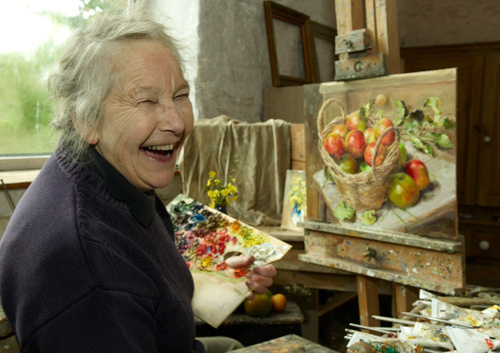 Anne's last solo exhibition took place at Forde Abbey, Somerset in September 2009. Forde Abbey is a beautiful 12th Century Cistercian Monastery and Stately Home with spectacular gardens. It made delightful setting for her work. Together with her daughter Catherine, Anne established Mill House Fine Art Publishing Ltd which specialises in faithful reproductions of her work, both as limited edition prints and greetings cards. Anne Cotterill died in August 2010. Anne Cotterill's work is featured in "A History and Dictionary of British Flower Painters 1650 - 1950 by Josephine Walpole, published by The Antique Collectors' Club, June 2006. The "Artist" Magazine features a Masterclass on Anne Cotterill's work in their May 2006 issue. Browse Anne Cotterill's beautiful reproduction prints and cards in our Online Shop. The cards are in categories of sizes and the print types are either lithographic (for framing) or giclee prints on canvas that are stretched onto a wooden frame ready to hang on the wall.